500 Watt Class D Amplifier module with outstanding sound quality. This version has been tweaked from our NCDX platform to have very high detail, and dynamic performance, by use of one of the best integrated OPAMP's on the market for Audio use, the ultra low noise LT1028. 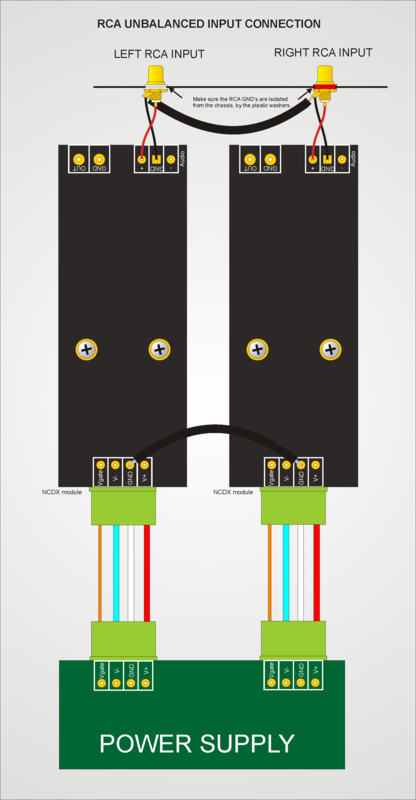 The NCDX-LT1028 is fully DC coupled. This means if you add a slight DC voltage from your preamp on the input of the module, it will get amplified into a larger DC voltage on your speakers. So it should be avoided, and in case you want to secure your amplifier from DC it, we recommend using a good bypassing capacitor, just like we do in the NCDX-Discrete and NCDV modules. 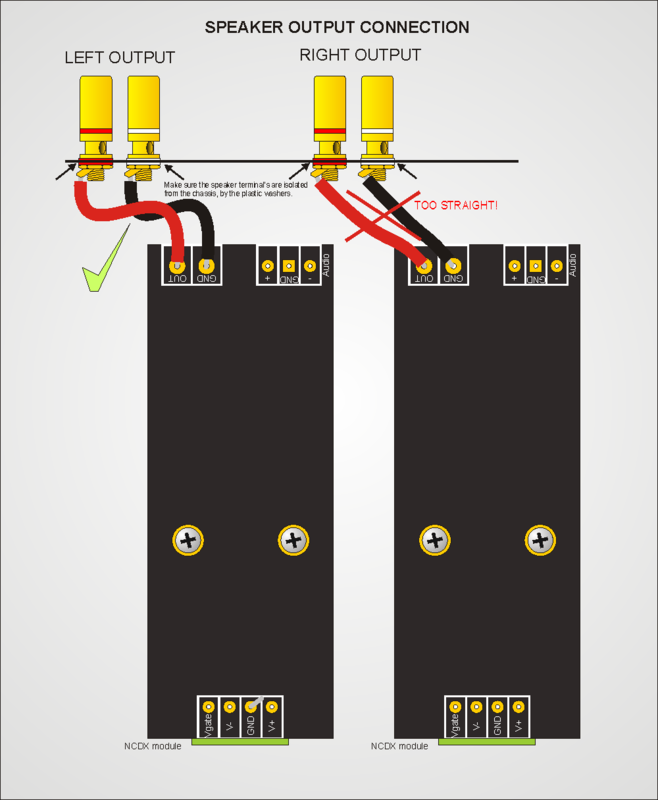 In case of large DC voltages, the NCDX safety system will shut the module down to safety mode. But again if you think you might get small DC voltage on the input, we recommend using a good bypass capacitor. The NCDX-LT1028 uses the the same power MOSFET's as the NCDV, and the software is adapted to allow up to 75V DC supplies, so power up to 300 Watts in 8 Ohms and 500W in 4 Ohms is possible. The maximum transformer secondary voltage allowed for this module is 2 x 50 V AC. We recommend use of our Big Cap powersupply, which has appropriate gate drive supply on board. Several upgrades have been added to the module since it was first introduced. The decoupling capacitors are now non-inductive / stacked polypropylene types, which will soften the high notes of the music, so you can better hear that air above the high-hats. The input OPAMP decoupling caps have been changed to 0.33uF instead of 0.1uF giving clean power to lower frequencies than before. The Q dampening capacitor of the output filter has been updated to a better 250V type (before 100V). The feedback filter cap has been upgraded to RIFA/Kemet type stacked polypropylene, that we also use in our NCDV module. We still use the special high grade output inductor with Silver Plated Teflon wire, setting this module apart from most competitors, using standard copper wire. The ferrite core used is a special low loss type with very high saturation current, giving low distortion, even at high low currents. Mechanical dimensions. Height above base plate is 36 mm. 1 Big Cap 39.000/80 Power Supply module. 2 RCA Phono jacks for input. 1-2 Meters of good speaker wire for hookup. 1-2 Meters of good (thin) signal wire for hookup. 1 Power Transformer 2x45V 1000 VA.
1 Mains inlet with fuse. 1 Enclosure (with aluminium bottom as cooling surface). We recommend or Big Cap power supply for this module, as a simple plug-and-play solution of utmost quality. One Big Cap power supply has up to 4 output connectors, so this is the official number of modules you can connect at one time. Connections to input terminals and power supply. 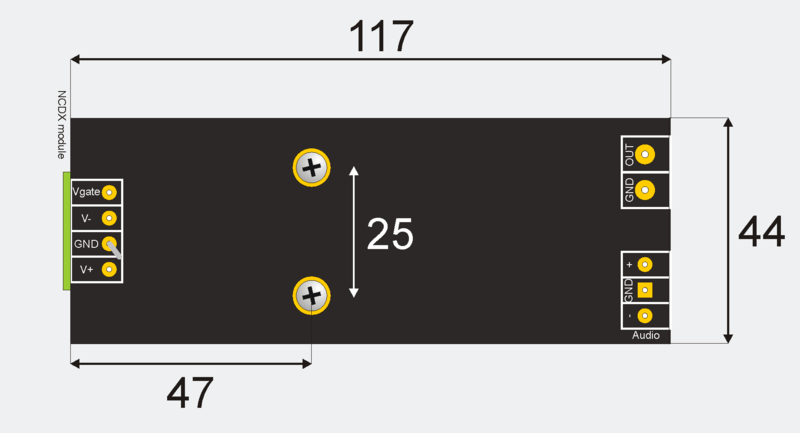 These terminals are found on our Big Cap power supply as seen on this drawing. In case you are using a different type of power supply, please see below. The main supplies can range from +/- 30V to +/- 70V DC, but please keep in mind the output power should be limited to 500 Watts by means of the power supply voltage. Power P = u²/R, where U is the transformer voltage, and R in the speaker impedance, for example 8 Ohms. So a 40V transformer will give you a P of 40² / 8 = 200 Watts. This module has both unbalaned (RCA) and fully balanced (XLR) input capability, by simply connecting that corresponding plug. NOTE: For RCA input connect the cold wire to GND and NOT -input. The -input is for balanced use only. 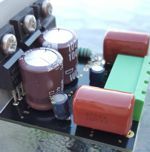 This paragraph is only intended as a guide for those who want to construct their own power supply module, and we show you here what is special about a power supply for a NewClassD amplifier. In addition to the normal + an d - 50V or 60V power rails you also need a Gate Drive supply of ~20V 100mA per module. The 20V should not be referenced to GND but to V-. So in other words 20V above -60V. Depending on the load of the amplifier, you should add more than 10.000uF capacity. 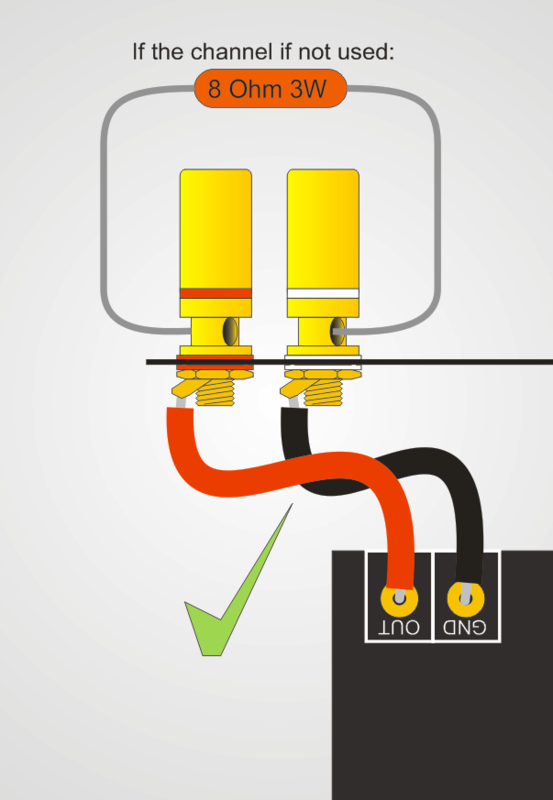 Note The wire length from capacitor terminal to each amplifier module should be kept as short as comfortly possible, and preferably no more than 20 cm. The sound character of different brands and types of capacitors must be taken into account when selecting capacitors. Some types sound hard in the bass while others sound more acoustic. Which is better is up to your specific taste.  Use a silver plated hookup wire with TEFLON insulation for best performance. 14 - 18 AWG. Do not stretch the cables, but leave enough for a smooth curve. Make sure all 4 speaker posts are isolated from the chassis. Unlike traditional Class A/B amplifiers Class D amplifiers 'don't like' open outputs. If you are building a 6 or 7 channel NCDX amplifier, some of the channels might not be in use at a given time. An open output will not harm the NCDX module but it will potentially force into protection mode. Therefore it's good practice to connect a dummy resistor of about 8 Ohms (6.8 - 10 Ohms will do) and 3 - 5 Watts across the unused output terminal. This way there will not be any stress on the module while it's not in use. You might also just pull the power supply plug out until you need the channel in question. It looks complicated, but it's actually just the normal connection repeated 7 times. The Big Cap power supplies have footprints for additional power connectors, so they have a total of 4. So for 7 channels you would have to connect 2 sets of power wires in some of the power connectors. One Big Cap power supply can effortlessly run all 7 channels by up to 500 Watts each. 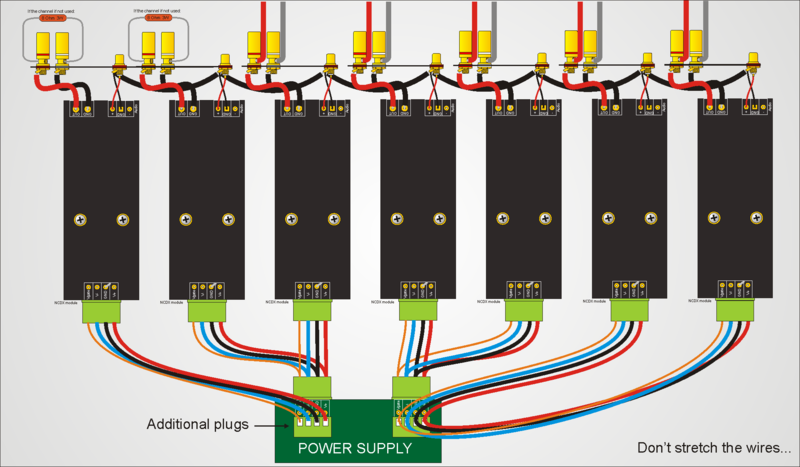 Connect all 7 input plugs GND to each other as shown with the black wire.